Renew your sense of adventure at this Pocono Mountain resort. Whether you are seeking stunning foliage in the fall or activities by the lake in the warmer months, Woodloch is the perfect retreat for the whole family. Seize the opportunity to traverse the private lake via kayak or sailboat, soar through the canopy with our 600-foot zip line, ascend to the peak of the climbing wall, and much more! The resort provides exceptional family entertainment year-round, including the Family Olympics, and "Spooktacular Haunted Hayrides" in the fall. It's the thrilling weekend you've been waiting for! Members receive up to 5% cash back (off of base room rate only, after travel), plus, children 6 and under stay for free! 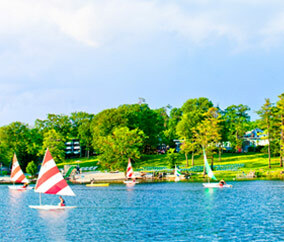 This exceptional four-season Poconos resort, nestled in a pristine mountain lake setting, is an ideal destination for family vacations, corporate retreats, weddings, reunions, senior group tours, class and scout trips, and milestone celebrations. Since 1958, Woodloch has provided exceptional hospitality and warmth, with a commitment to the spirit of spending quality time with family and friends. Enjoy all nature has to offer with exclusive classes, tours, outdoor excursions, and nature walks given by local naturalists, herbalists, and survivalists.